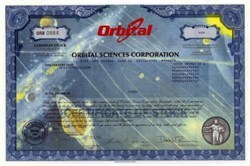 Beautifully engraved Certificate from the Orbital Sciences Corporation . This historic document was printed by the American Banknote Company and has an ornate border around it with a vignette of a woman holding a globe, with an underprinting of the solar system. This item has the printed signatures of the company's President and Secretary. 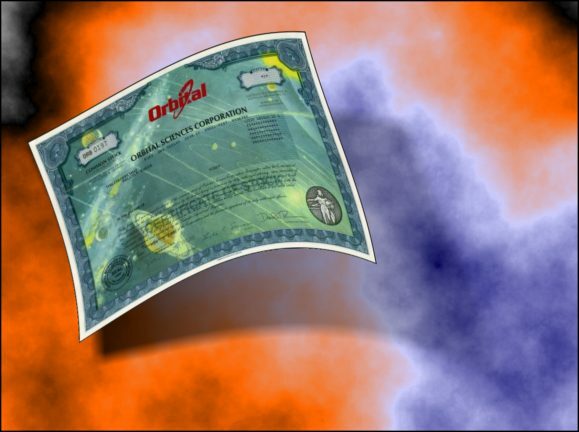 This is one of the nicest modern certificates around. Orbital Sciences Corporation was founded in 1982 with the goal of making the benefits of space more affordable, accessible and useful to millions of people on Earth. Since then, they have grown to become the worlds leading developer and manufacturer of smaller, more affordable space systems. They have pioneered new classes rockets, satellites and other space technologies. And these technologies have become the building blocks of space-related systems and networks. The company also provides vehicles that launch satellites both from the air and from the ground, as well as satellite navigation and communications products. The Antares is a two-stage launch vehicle designed to deliver medium-class payloads weighing up to 6120 kg into space. Initially developed to demonstrate commercial re-supply of the International Space Station under a NASA contract, the Antares provided access to a variety of orbits for civil, commercial and military payloads. The first launch of Antares took place from NASA's Wallops Flight Facility on April 21, 2013. The Antares suffered a failed launch on October 28, 2014, that completely destroyed the vehicle and badly damaged the launch pad at Wallops Island, Virginia.